Between the 9th June and 2nd July 2017, using the promotional code, “PHOQUES” (SEALS), for a stay booked over a week-end* or a 4-night mid-week** stay, we are pleased to offer an excursion for 2 people “Seeing the seals”. A short guided walk will lead you to these affectionate marine mammals, relaxing on their sandbanks. 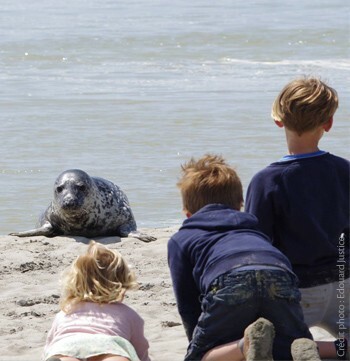 You are not allowed to get any closer than 300 metres from the seals so as not to frighten them: they feel exposed out of their natural element, water… But it is actually in the Baie de Somme that you will find the largest colony of seals in France. There are around 600 animals from two different species: the common seal and the grey seal. The former are sedentary and breed in the Baie de Somme. You will find out absolutely everything there is to know about seals, thanks to your guide’s explanations! The guide will supplement the brief information that you will have read in this article; and you may borrow binoculars and telescopes to observe these animals. Meet at the Pointe du Hourdel to set off on this nature interlude that will charm young and old alike! That’s the walk to see the seals ticked off the list! A day already filled in at Domaine du Val. For the second day, if you have chosen the week-end option, or for the other 3 days if it is the mid-week deal that has tempted you, there is a wide choice of activities available to you! On site, relax in the pool and spa, or on the golf course; and at the Baie de Somme, there is the steam train, the gardens of Maizicourt or Valloires, Amiens cathedral… not forgetting trips to the beach and swimming in the sea.